The little places that change you. As I write this, my wife and I are travelling in Japan, hopefully to photograph some cherry blossoms (I’ll post any good ones to my Instagram). 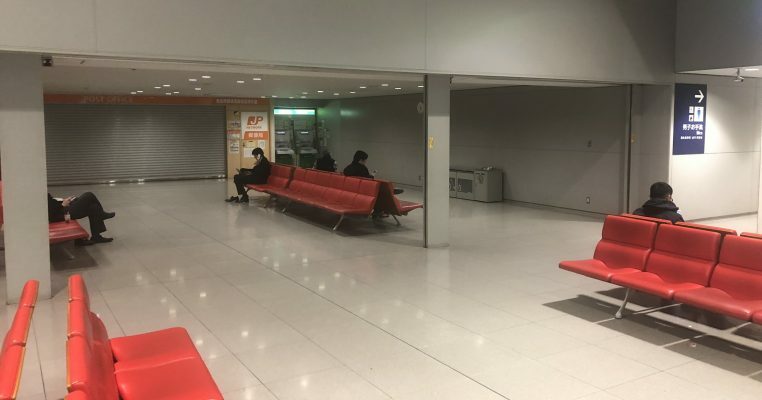 Travelling through Kansai Airport, I asked her to pause while I took this photo of a very nondescript post office in the terminal. I wanted to get a snapshot of a place where I went through a metamorphosis 4 years ago. I was on my way to MoodleMoot Japan 2015 in Kyoto, and fresh off the plane, I felt overwhelmed by Japan. It was quite foreign, and feeling tired from the flight just magnified my anxiety. I was regretting signing up for my first Internet of Things talk. Four years later, I’m finally willing to admit that my slides were not complete. And the showcase piece of my presentation – my internet connected tie – was repaired less than 48 hours prior when the USB connector snapped off my Arduino Lilypad. I was just a part-time TAFE web design teacher. “This will be a disaster,” I thought. I felt like I had no business being here. This was classic Imposter Syndrome. The post office was where I picked up my pre-ordered portable wifi, and those reddish-orange benches is where I spent 15 minutes collecting my nerve to tackle this trip. I acknowledged my fears, both about my presentation and about travelling to where I don’t speak the language. The technical details sorted themselves out once I spent some time on the hardware and slides in my hotel room. However, getting to the hotel would take some time. Not because of disaster but because of adventure. Once I acknowledged and then dismissed my fears, I was able to enjoy myself; Japan is an awesome place. I took the wrong train but quickly got back on track with help from the locals. I found the crazy parts of Osaka and Kyoto you only see in movies, and occasionally I had unofficial local tour guides help me understand and put in context the sites and sights of Kansai. My presentation went well, and it was not the last time I took a suitcase full of IoT toys to an education conference. It was the confidence I built during this trip which started me down this road presenting at conferences, going into Moodle consulting, and even to my current position as an Instructional Designer. And as for travelling in Japan, I suppose the fact that I’m back for a third time in five years is all I need to say. As I left Japan back in February 2015, I passed by this corner again while checking in. At first I didn’t recognise it; the lighting was different at that time of day and I was a bit turned around. But more than that, I could feel I had grown. Change is usually gradual, slow, undetectable. But every now and then, change is quick, sudden, and undeniable. We all have our moments of self-doubt. It was nice to revisit a place that changed me. A place where I put aside my Imposter Syndrome and just enjoyed the journey – both metaphorical and literal. Do you have a similar story, a place or event that changed you in an instant? MoodleMoot Philippines will be held on May 8 to 10. It looks like it’s going to be a fantastic event this year; check out their Facebook page for the latest details. This will be the second Moot in the Philippines. MoodleMoot Australia will be held in Melbourne on July 1 to 3. Earlybird tickets are available until May 31, and the Call for Presentations is open now. Interesting news from Moodle HQ last week; MoodleMoot Global will be held November 18 to 20 in Barcelona. While Barcelona isn’t in the Asia Pacific region, I thought this was of enough importance to add it to the calendar. It will be interesting to see what’s planned for this event as we get closer to the dates. THETA – The Higher Education Technology Agenda will be held in Wollongong, NSW on May 19 to 22. Registration to this biennial conference is currently open. Check out the keynote speakers and decide if you want to visit the Illawarra this May. EdTechPosium has just announced their 2019 conference dates; October 28 & 29 at Australian National University, Canberra. You might also know EdTechPosium by its former name – MoodlePosium. More details when they are announced. Kenneth “Scott” Huntley is a Learning Designer with TAFE NSW and WordPress instructor with The Parramatta College. Scott is a Canadian (Nova Scotian) Expat living in the Southern Highlands of Australia. Scott is a Moodle enthusiast and an Internet of Things hobbyist. Kenneth "Scott" Huntley is a Learning Designer with TAFE NSW and WordPress instructor with The Parramatta College. Scott is a Canadian (Nova Scotian) Expat living in the Southern Highlands of Australia. Scott is a Moodle enthusiast and an Internet of Things hobbyist. Thanks for the feedback; I’m glad people liked this post and I hope people continue to post their own stories. I’m back from my holidays today with some news to share in next month’s column. Well, I’m jealous of Scott being in Japan again (I also got lost in Osaka my first visit, and then got accidentally drunk on Sake). So nice to reflect on one’s own development like this eh? Thanks for sharing. Mine was Antarctica in January 1992. We move forward a different person from that day.